LONDON: As Naveen Pattnaik, Chief Minister of the Indian State of Odisha, continues his nine-day visit to the UK, campaigners say urgent action is required to stop the destruction of his State’s precious environment and protect the rare tigers living in it. Located in Eastern India, Odisha is home to Simlipal National Park, the only known habitat of the elusive melanistic, or black, tigers. Mr Pattnaik is in Britain to promote his home state and to discuss development issues with the UK Government’s Department for International Development. The UK has long been a major donor to the region and since 1999 has invested £183m in projects in Odisha. The Environmental Investigation Agency (EIA) believes the security and management of critical ecosystems such as Simlipal must be on the agenda during his visit. EIA campaigners visited Simlipal earlier this month and were alarmed to witness the plight of security staff; unarmed and without proper equipment, training or support, they are still expected to protect the forest from poachers, illegal logging and encroachment. Simlipal is one of India’s oldest tiger reserves. Declared in 1973 under Project Tiger, it contains 2,750 sq km of forest and is prime habitat for tigers, prey species and elephants. But with frontline staff paid less than US$50 per month and lacking even basic necessities such as mosquito nets, anti-malarial medicines and food rations, protection of the reserve has suffered. In recent years, the park has seen numerous cases of wildlife poaching, elephant killings and incursions by Maoist insurgents. In February 2012, approximately 1,000 armed people entered the park to hunt wildlife, including species upon which tigers depend for food. Two missions were dispatched by India’s National Tiger Conservation Authority (NTCA) to investigate the state of the park following raids by militants in 2009 and the high-profile killing of elephants in 2010. A number of recommendations were made seeking to “seriously shake up” the running of the reserve, but so far the Odisha state government appears unwilling to implement them. “This is not a question of money,” said EIA Campaigner Alasdair Cameron. “The crisis at Simlipal is due to a failure of political will. There have been several studies highlighting the steps that need to be taken, but there has been very little action on the ground by the State. Among the NTCA’s calls are action to address the involvement of some forest officers in concealing incidents of elephant poaching, creation of an independent monitoring body and a wildlife crime intelligence-gathering system, special efforts to seize illegal firearms, and proper funding for enforcement. “All the money Mr Pattnaik might need to do this is already to hand – all that’s lacking is his will and that of his administration to responsibly implement the NTCA’s recommendations,” added Cameron. Interviews are available on request: please contact Alasdair Cameron at alasdaircameron@eia-international.org or telephone 020 7354 7960. One of the most disputed felid cryptids is the “Black Tiger” of the Similipal Tiger Reserve. The State Forest Department and Dehra Dun-based Wildlife Institute of India (WII) may have a huge difference of opinion over exact number of tigers in Bhubaneswar State, but the agencies are unanimous over presence of melanistic tigers in Similipal. Even as the State and WII continue to be at loggerheads not only over number of big cats but enumeration methodology too, there is no such difference as far as melanistic (some call it black) tigers are concerned. ‘Wildlife Census in Orissa,’ a latest publication by the Forest and Environment Department, has confirmed the fact that tigers with colour aberration, mostly towards black, are found in Similipal Tiger Reserve (STR). It comes to light through WII’s camera trap technology, a methodology which left the State Government ruffled when the National Tiger Conservation Authority (NTCA) and Dehra Dun-based institute released results of tiger census earlier this year. Interestingly, the publication puts the number of tigers at 132 in habitats across the State. The figure for Similipal is 69 (excluding cubs) as per the pugmark tracking method. This almost is a climb-down from the higher figure of 94 that the Department had been dishing out for past several years, after it met with serious posers from camera trap technique used by WII-NTCA which led to a drop in the number. The controversial WII census had put tiger number at 45 in the entire State, and 20 in Similipal. However, there is no such controversy over presence of the melanistic tigers though. The Forest Department publication, while terming the analysis of the camera trap as unclear, says that the method needs to be tested in different habitats. But it presents pictures of the census showing the ‘black’ coloured tigers in STR. ‘‘It substantiates the postulation made on the basis of research carried out in STR on colour aberration in tiger in the research work Born Black: The Melanistic Tiger in India,’’ the report says. The Similipal Tiger Reserve is situated in the district of Mayurbhanj, Orissa, India. It lies between 86°5? and 86°37? east longitude and between 21°30? and 22°8? north latitude. 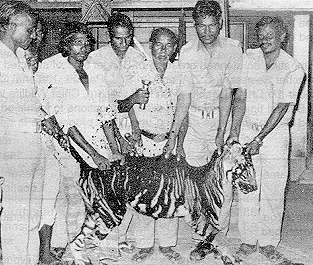 Beginning in 1975–1976 a number of sightings of black tigers have occurred in Similipal Tiger Reserve. Observation 1993: On 21 July 1993, around 10 a.m., a boy, in self-defense, killed a young melanistic tigress with a bow and arrows. The incident occurred in the village of Podagad in the Bhandan river valley west of Similipal Tiger Reserve. The main peculiarity in body colouration was that the dorsal stripes were tawny and the ventral stripes white on a black background [or the black stripes were wider than the orange dorsal and white ventral backgrounds, ed.]. The animal was photographed (see photos) and videotaped.